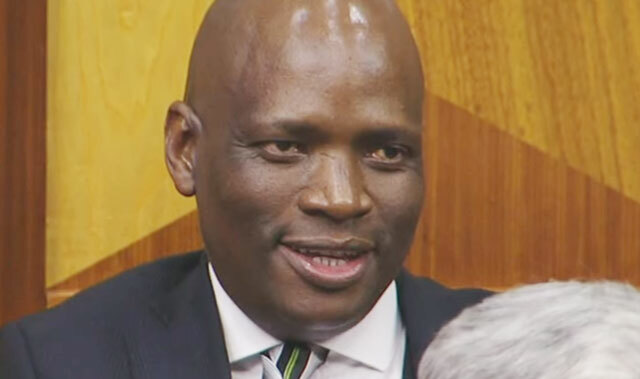 SABC group executive of corporate affairs Hlaudi Motsoeneng says he can change South Africa in six months. “In South Africa, realise one thing, there is only one Hlaudi, no one else. “And realise, I can change South Africa within six months,” he told about 100 Friends of Hlaudi supporters outside the Western Cape high court in Cape Town after judgment was reserved in a Democratic Alliance bid to have him fired. Still energised after two days of lengthy technical argument, Motsoeneng walked down the court steps and explained his mission to his supporters. He said the decision to introduce the “90% local” quota for music and television productions was not made by “looking this way, or that”. Motsoeneng has been celebrated by local artists and performers who laud his quota decision as just what local artists need to survive. But the public protector received complaints about him in 2011 alleging that he did not have a matric as he claimed and that there was financial mismanagement and interference in the SABC board’s work by the communications minister at the time. He was cleared in a disciplinary inquiry that followed the public protector’s report but is fighting for his job after the same court ruled earlier that his appointment was irrational. The DA also questioned why the SABC moved him from chief operating officer to group executive of corporate affairs when it had expected Motsoeneng to be fired. After hours of verbal battles over whether his tenure was contractually still valid or whether a political party can ask a court to intervene in a state institution’s affairs, Motsoeneng was in form, basking in salutations from supporters. After listening to lawyers speak about him for two days in the civil case, it was his turn to speak, but outside the court. He said in the past the SABC only did business with big established companies, not giving emerging companies a chance. The problem at the SABC was not between black or white people. There were problematic black people and there were good white people, he explained. It was about whether people supported speedy transformation. The urgency of the need for transformation meant there had been no time to conduct years of research to help decide what to do. He said he was happy to be paying black people and rubbished claims that the SABC had no money. He believes the point of the public broadcaster is not to have billions in the bank but to empower people. Motsoeneng said he was tired of black people being portrayed as corrupt. Judgment was reserved in the case. It becomes more bizarre as time marches on. Maybe he should seek the interventions of his isangoma so that he can get the utokoloshe off his shoulder; then he needs to see his inyanga at least once a week for 3 years……..
I’m just not sure where we get this idea from that black people are corrupt, no idea what so ever.